Unbelievably, the incredible Stampin' Up! promotion, known as Sale-a-bration, which has been running since the beginning of the year, is now rapidly drawing to a close. 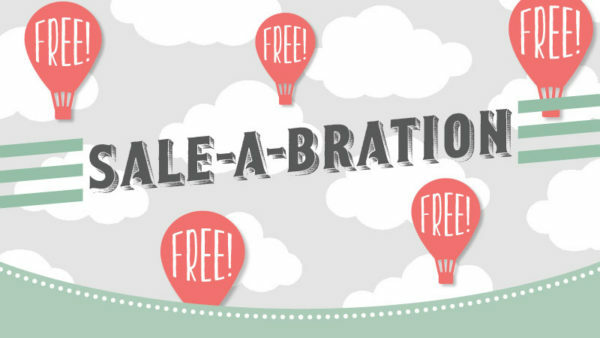 When Sale-a-bration started back in January, the promise of three months of these fabulous offers seemed too good to be true. But it has gone so fast, and here we are now in the last two weeks. 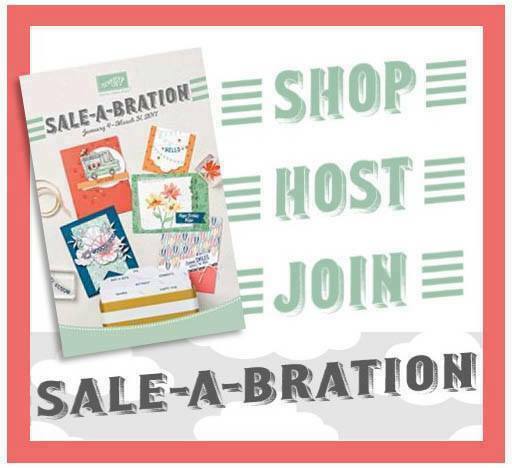 Please don't leave it until the last minute if you would like to get your hands on any of the free Sale-a-bration products. Some of them are now dangerously close to selling out and if you leave it too late, you may just miss out. If you'd like a closer look at some of the free products available, here is another chance to take a look at my video below, showcasing the products I have earned and used. (Please excuse the background noises about half way through - my husband decided it was a good time to empty the dishwasher!!). 1) Select a free item from the Sale-a-bration catalogue for every £45 you spend on Stampin' Up products from either the Annual catalogue or the new Spring Summer one. There are 15 lovely products to choose from ranging from complete stamp sets, ribbon, patterned papers, glimmer papers and even a cute printed storage tin to store your cards. 2)Join Stampin' Up by buying the "starter kit" and for just £99 you can select £130 of any Stampin' Up product plus TWO extra stamp sets for free (value if you chose the most expensive sets would be £97.00) - postage is included too. So up to £227 worth of product for just £99!! !You are welcome to simply buy this package for yourself and do nothing more. 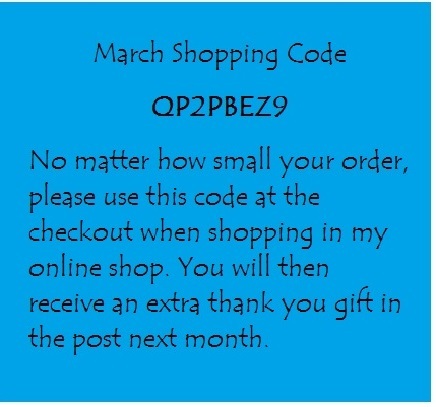 If you wanted to place any further orders, you would receive a 20% net discount on anything purchased. Contact me if you'd like to learn more or come back tomorrow to see more details of this great offer! 3) Earn an extra £20 of hostess rewards on all orders over £200 - plus the freebies mentioned in point 1 too! 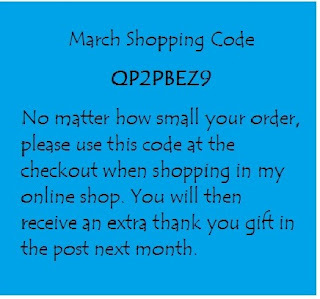 PLUS - if you are kind enough to order through me (just click the "Shop Now" button at the top of the page) and use my shopping code (see below), next month you will receive another free package of goodies from me! If you have any questions or if there is anything I can help with, please don't hesitate to get in touch. And if you would like to receive a hard copy of either the Annual Catalogue or the new Spring Summer one or BOTH along with the Sale-a-bration brochure (no charge for any of these), please let me know by commenting below, emailing me, phoning me or completing the form in the link at the top of this page. If you are ready to order then just click on the "Shop Now" button at the top of this post, or email or phone me - if you live nearby (Chertsey, Surrey - just off junction 11 of M25) you could even collect your order from me and save the postage!